Oasis Café and Roadhouse. Discover Lake Eyre and the Marree Man. Welcome to Marree, Outback South Australia. In the 1890s this was the site of one of the largest Date Palm plantations. In 1897 there were around 2700 plants. Eventually, due to drought, remoteness and high costs this site was abandoned. The start of the famous Birdsville and Oodnadatta tracks, home of Lake Eyre and district. Enjoy and discover the old Ghan railway, have a relaxing afternoon at Hergott Springs or take a flight over Lake Eyre and Cooper Creek or take a short drive up the Birdsville Track to Lake Harry Ruins and Lake Harry and if your lucky it may be full of water. The one stop shop in the north. The Marree Roadhouse, Oasis Cafe/Bistro is open 7 days a week from 7.30am till 6.30pm for all your general needs, take away meals, coffee, cold drinks, ice, groceries, fresh fruit and vegetables, souvenirs, camping equipment and tools. We also have “cash out” facility and EFTPOS available. We are also the local bottle-shop, post office, fuel stop for unleaded and diesel, tyre station for repairs and replacement, bakery and more recently a fully licensed bistro. Flight information and bookings are also arranged from here. AVGAS and JET A1 FUEL is also available all year round. What was formerley a little run down shop has gone through a huge transformation in the last couple of years thanks to Owner/Manager Lyall Oldfield who had the foresight and was passionate about making it bigger and better with more to offer. Come and visit this massive new shop which boasts a large bakery and kitchen, a fully licensed bistro for delicious evening meals, a great selection of wines. Fresh bread is made daily in peak season as well as pasties, pies, pizza and our version of hot dogs. You definitely won’t go hungry. One block away we have more accommodation to offer in the Oasis Caravan Park which has plenty of camping and of course our comfy cabins. 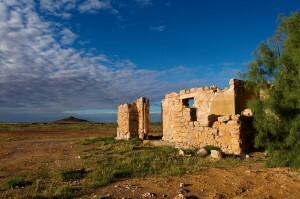 For information about Marree and surrounding area, our staff are only too happy to help. Talk to one of our helpful staff.